The Adventuress: Dangeresques and Vampyres and Deals, Oh My! 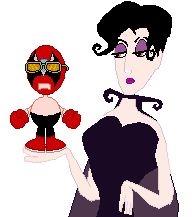 Head over to the Telltale site or fire up your Wii and head to the Wiiware Games channel to download the latest episode of Strong Bad's Cool Game for Attractive People, Dangeresque 3: The Criminal Projective! Also, the new trailer for the final episode reveals the name as 8-bit is Enough, and has some nice surprises for fans of the Homestar Runner universe with appearances by fan favorites Trogdor and Stinkoman. To celebrate the release of Dangeresque 3, Telltale has a deal going in their store where you get free shipping on anything and everything if you have at least one downloadable game in your cart. And although it's not made by Telltale, I feel I must let everyone know that A Vampyre Story, the first game by Autumn Moon (founded by Bill Tiller of Curse of Monkey Island fame) is now available in Germany. Non-German folk (such as myself) can download the demo of the game (which is available with both German and English text and speech) here. Update November 20: Gamer's Gate now has A Vampyre Story available to purchase for direct download. UK Gamers can purchase the game in shops now or at Play online.